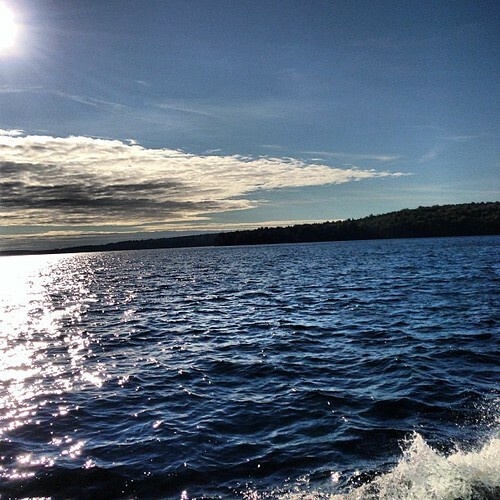 Lake Superior, from the boat #lakesuperior #latergram #michigan #michigansky #upperpeninsula #puremichigan #greatlakes, originally uploaded by earthchick. Lake Superior is my favorite of the Great Lakes. It is the biggest of the lakes, and the deepest, and the coldest, and the roughest. To me, it seems wild, mysterious, almost mystical. When I stand on the edge of Lake Superior, I can feel like I am standing on the edge of the world. It is an overwhelming place to be. This summer has been a little overwhelming, too. My travels, which are finally coming to an end, have taken me, in seven weeks time, over 4500 miles, all by car. I took a doctoral class in Georgia, spent time with extended family on the beach in Florida, took my church youth group on a mission trip to Detroit, and spent a few days in the upper peninsula of Michigan. Both my mother and my mother-in-law wound up in hospitals, each while we were on vacation; both are still hospitalized at the moment, but with good prognoses. But perhaps the most overwhelming aspect of this summer was what happened when I posted my annual sandhole awareness post , which caused my initial sandhole story to go well and truly viral, with more than 600,000 hits. Since the whole point of posting our story every year is to raise awareness about sandholes, in hopes of preventing future accidents, this is, of course, fantastic. But it was also unnerving – to relive some of the emotions of our original trauma, to read heartbreaking stories of other people’s losses, to field questions, and to deal with a few unpleasant comments. I haven’t been able to respond to most of the comments that have come in since mid-July, partly because of my travels and family/work needs, and partly because of the volume of the comments. Please do know that I have read every comment, and I so cherish your good thoughts for my family, as well as your willingness to share your own stories. There was so much I wanted to say, especially about post-traumatic stress, and there just hasn’t been time or mental space to do so. Which means my blog has been unintentionally silent. I didn’t mean for it to be so. It has seemed trivial to come back and start posting all my little crafts again when there were so many larger things to say, but for now that is what I intend to do. And when I have the emotional wherewithal to deal with deeper things, I will. Thank you, dear readers, for reading along, for sharing your stories with me, and for sharing my story with others. You’re absolutely right to ‘just’ post about your crafts – that’s the whole point of having a blog – it should serve your purposes and yours alone. If it happens to serve some other purpose, it’s just icing on the cake but first and foremost, I think personal blogging has to be all about “me” (well, you on this blog, but you know what I mean). When your head and heart are ready to post about bigger things, you’ll do it. That sounds like a lot of miles to have covered in a short space of time, too. Hope the rest of your holiday is wonderfully relaxing and refreshing.